- Full integration of weather forecast in all calendar views and widgets! Experience the most stylish Android calendar with 6 powerful calendar views and 6 beautiful (lock screen) widgets. Now with weather forecast! 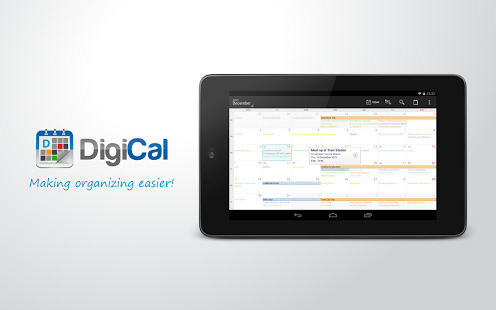 DigiCal is a stylish and user-friendly Android calendar that syncs with all calendar servers that are supported on Android such as Google Calendar, Outlook.com and Exchange. The clean and intuitive user interface is available for smartphones and tablets running Android 2.2+. 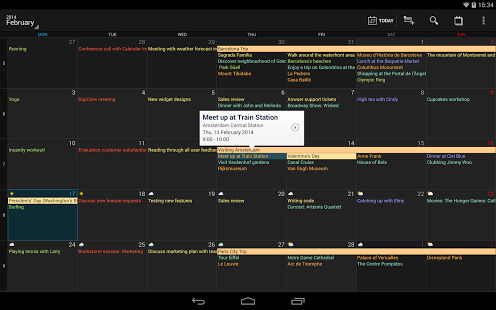 Choose from the day, week, agenda, month, text month and list view in portrait and landscape mode. Use our 9 preset themes with live preview to easily customize the list, grid, day, day list, month and month calendar widgets. Adding a location to your appointment has never been easier. Just type in the name of the place (cafe, store, and park) and DigiCal will look up and save the address. Google Now (Android 4.1+) knows where you’ll need to go, if you’ve saved the location. It keeps an eye on the current traffic, plan your route and notify you when you should leave. Our notifications are upgraded with shortcuts for snooze, maps and navigation. - Worldwide weather forecast available in all the calendar views and widget types. - Weather forecast for today and the next 2 days. - Detailed weather info: humidity, precipitation, pressure, cloud cover, wind, sunrise and sunset. - Detailed hourly weather forecast for the next 48 hours, and 3 hourly for the next 15 days. - Interactive temperature and precipitation graph. - Easy location management: choose and save your favorite places. ☎ Do you need help or want to share your feedback with us? Feel free to contact us at digical@digibites.nl.